Together with Dubai and Doha, Istanbul’s Ataturk airport is one of the important airline hubs for people travelling from Europe to Asia, and with Turkish Airlines’ competitive prices, it is being used as a layover hub even for more remote destinations in the United States and South America. If you have a layover in Istanbul and you are considering heading from Istanbul airport to city centre, follow our tips below to help plan out your visit. Istanbul is vast, yet the most characteristic area concentrates around Sultanahmet, the historical centre and location of most of Istanbul’s important sights. This makes it an ideal layover destination for those who can only afford to spend a few hours in the city. 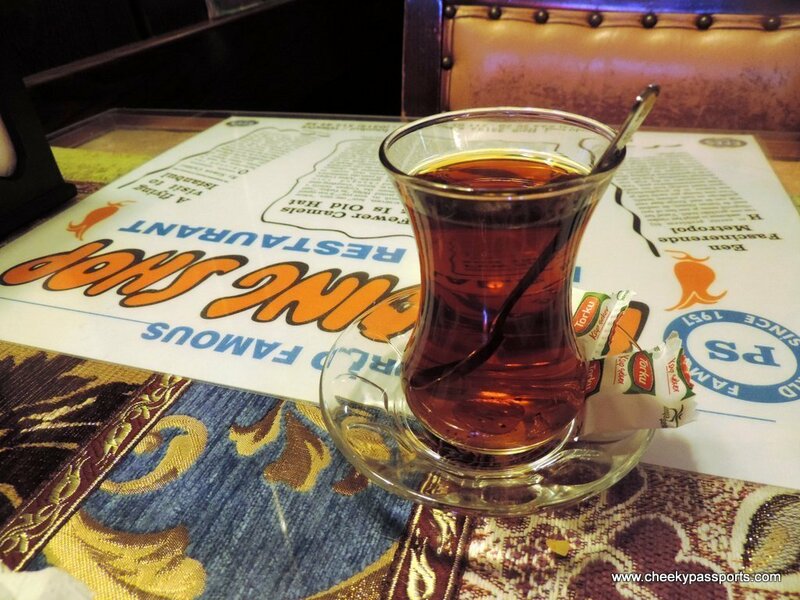 A full day’s layover in Istanbul would be needed to visit all of the below-mentioned places. Check out visa requirements for Turkey beforehand if you plan on leaving the airport during your layover in Istanbul. Maltese passport holders currently (December 2016) require an e-visa which can be applied for online and is free of charge. 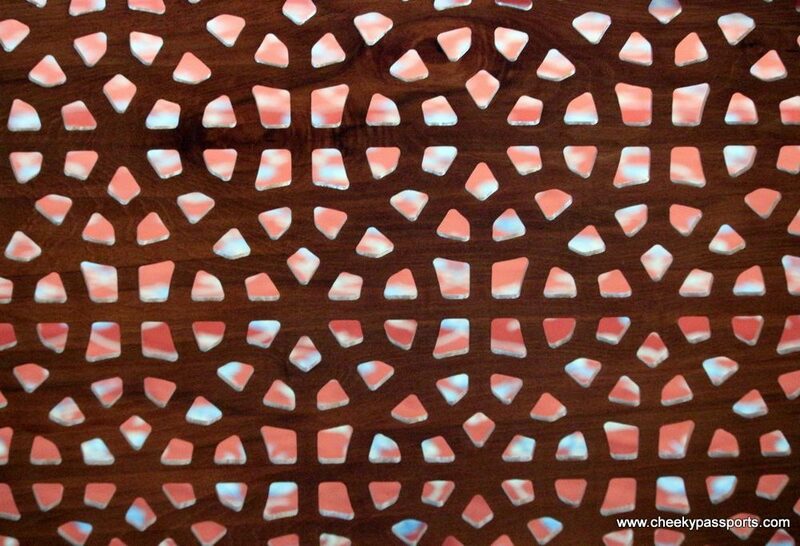 The multiple-entry e-visa is valid for 180 days, but your stay should not exceed 90 days. Visa requirements are often subject to change so it is important to check out the latest available information regarding visa applications and entry restrictions. If are travelling with luggage and you can’t have it checked right through to your final destination, there’s a convenient, well-marked, 24-hour luggage deposit in the arrivals area. The cost of storing your luggage is 20 Turkish Lira per piece per day for suitcases and backpacks. Istanbul is a very chaotic city and is home to one of the world’s greatest congestion problems so be sure to keep this in mind when planning your trip from Istanbul airport to city centre. Although Sultanahmet Square is theoretically only 30 minutes away from Ataturk airport, your journey might easily take 1-2 hours each way. Taxis are rather affordable at about 50 Turkish Lira (about €9)/taxi each way and since we were traveling in a party of four, a taxi cost us €2.25 per person each way, thus making this option our preferred choice of transport. Alternatively, we were told that public tram transport is a cheap, safe option for traveling from Istanbul airport to city centre, however there is no direct line to Sultanahmet (although the change of lines seems to be quite simple). If traveling from Istanbul airport to city centre and back by taxi, be sure to leave the centre latest 1.5 hours before you need to be at the airport. We left one hour before and only just made it. Taxi drivers might also take advantage of the fact that you are running late and try to overcharge you to get you to the airport in time for your flight. Negotiate a price before getting into the taxi. 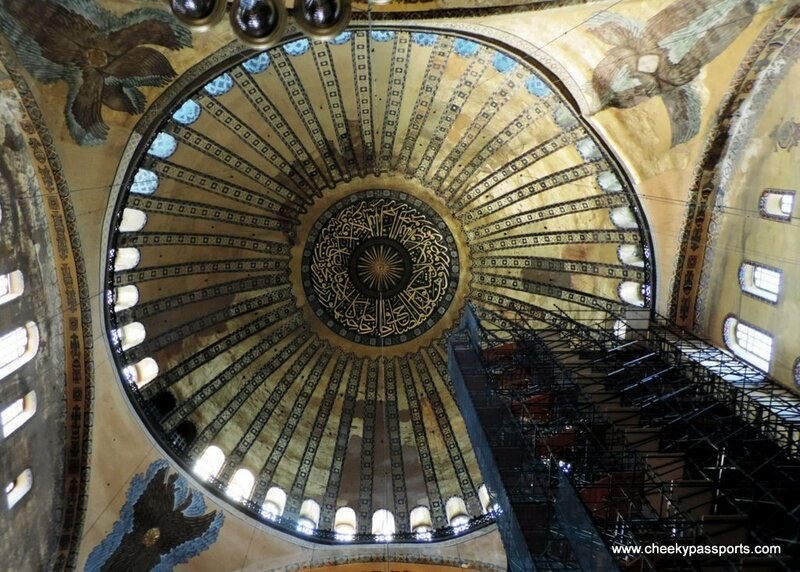 The ancient structure is famous for its huge dome. Formerly a Roman church which was later converted to a mosque, it is now a museum housing Christian mosaics and Islamic Calligraphy Roundels. There was scaffolding on the inside of the structure when we visited in September 2016 but this didn’t make the structure any less impressive. 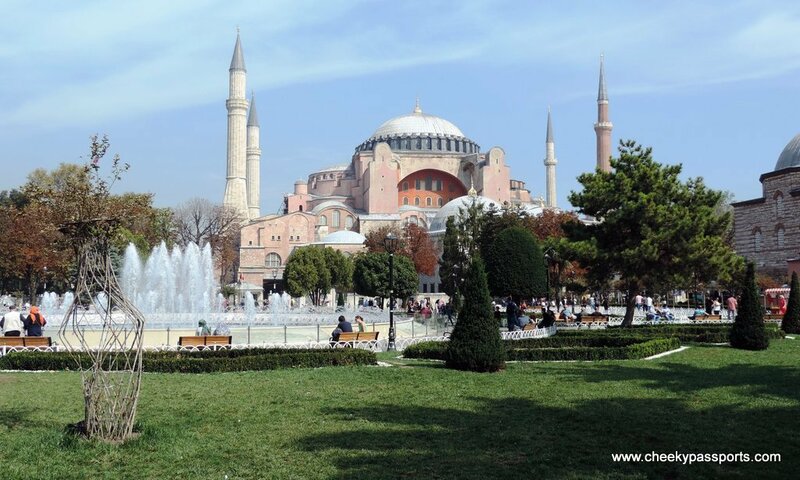 Visiting the Hagia Sophia should definitely be on your list of things to do during your layover in Istanbul. Most of the mosaics are on the upper gallery. Read up its history before visiting so as to better understand what you’re seeing. Entrance fee was 40 Turkish lira (about €7) in September 2016. Very few people were around early evening at around 18.00 even though it was peak season, so this is possibly a good time of day to visit. 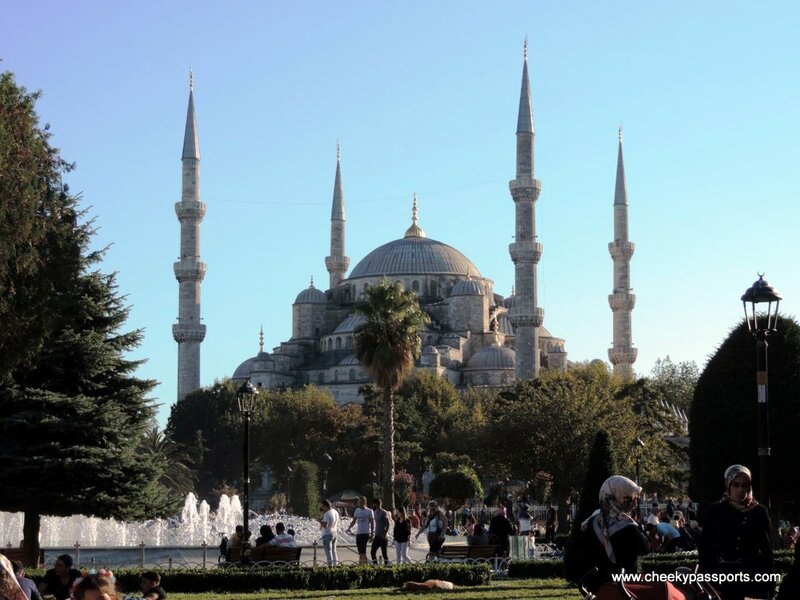 Also known as the Sultan Ahmed Mosque, the Blue Mosque is one of Istanbul’s better known sights and its magnificent interior is definitely worth seeing during your layover in Istanbul, whether or not you have any religious inclinations. 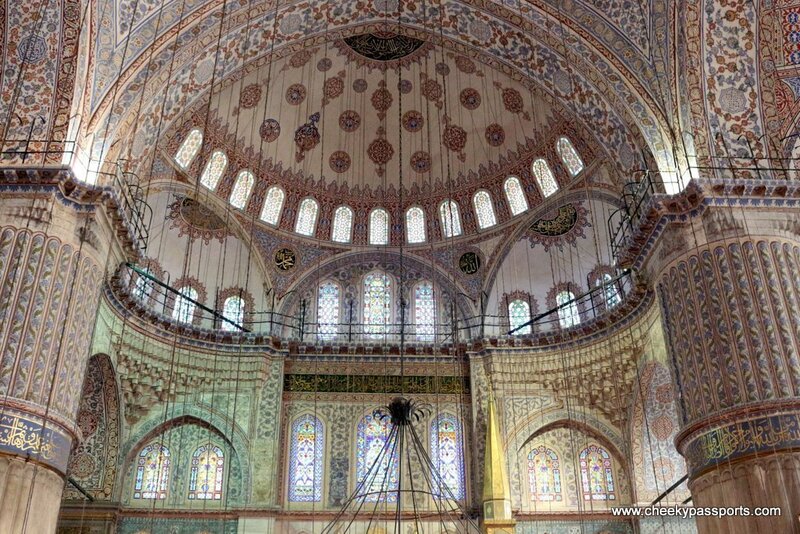 The Blue Mosque is an active mosque and respect should be shown at all times. The mosque is closed to non-worshippers before, during and after prayer times (for about 90 minutes at a time), six times a day and in the morning on Friday, so you need to plan out your visit carefully. The exact times of prayer change every day since they are traditionally set according to the movement of the sun, but they can be found online. Visiting the mosque is free. You are provided with bags to put in your shoes which can be left on shoe racks once you enter the mosque. Women are required to wear head scarves inside the mosque (these are provided for free at the entrance but you might want to carry your own for hygiene purposes) and may be asked to put on a robe (provided) if their dress is deemed inappropriate; men should not wear shorts and if they do, they will also be provided with a robe to wear. 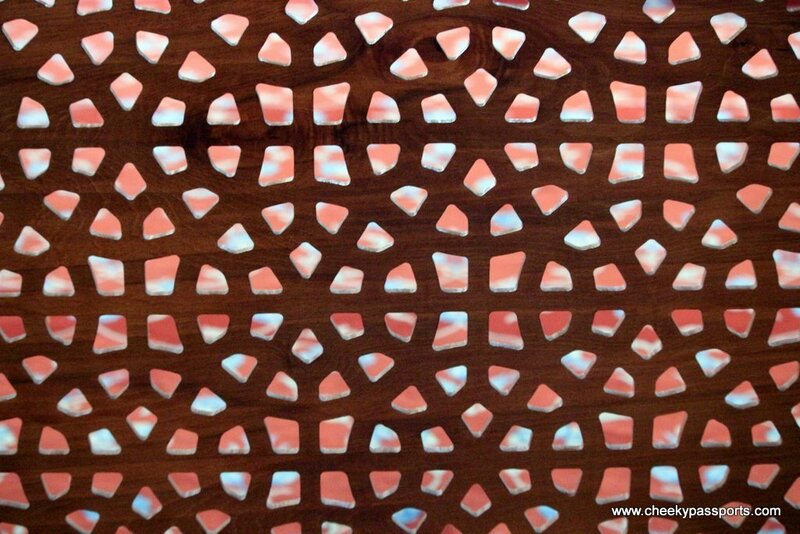 You can take photographs inside the mosque but avoid using your flash. If the mosque is about to close for prayer, you will be asked to leave and guided to the exit. 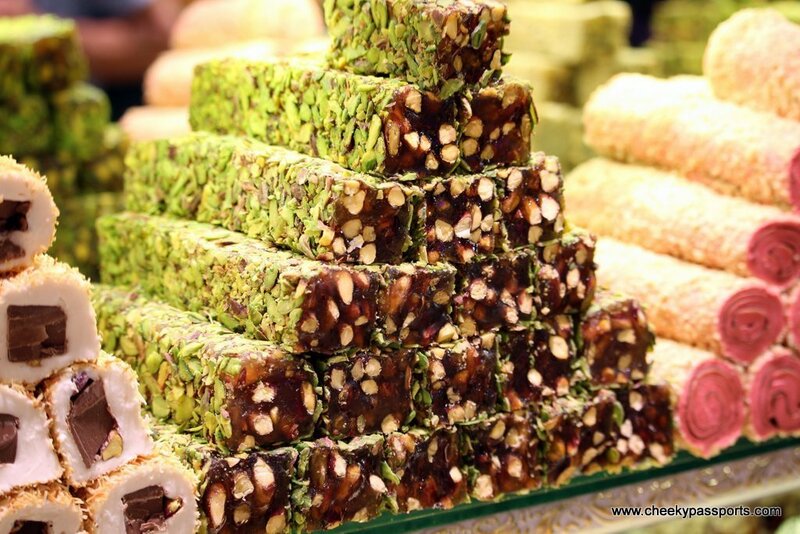 Did you get hungry during your layover in Istanbul? The best way to experience Istanbul’s soul during your layover in Istanbul is to walk around the old town and “feel” its street life. You can either plan a walking tour to include the city highlights or just wander around for a few hours taking a break at one of the many coffee shops or grabbing some street food from local vendors. 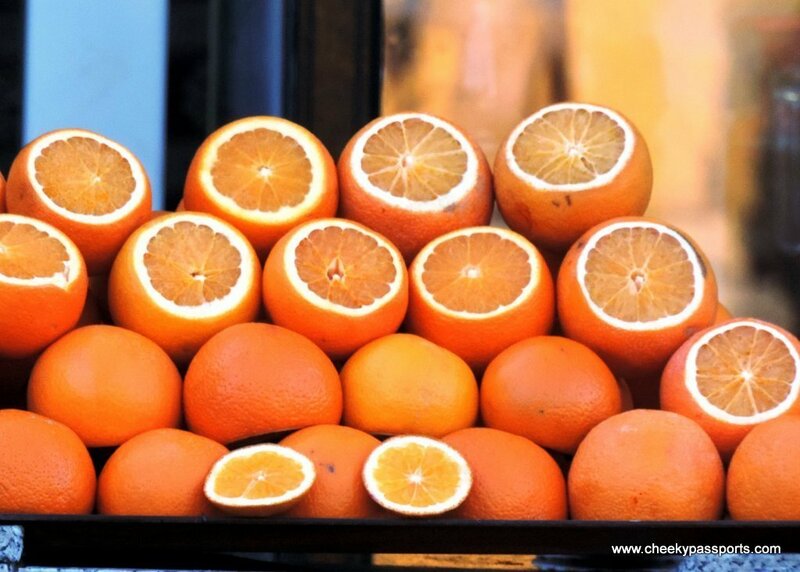 We found food and drinks to be very affordable even around the historic centre – grilled corn on the cob and fresh orange juice vendors are found literally everywhere. It is easy to get distracted so keep an eye on the time! Istanbul’s streets are not for those who suffer from claustrophobia – people will bump into you or whizz past you constantly so keep this in mind if you find it annoying. Keep an eye on your belongings, Istanbul is a huge city with plenty of pickpockets. 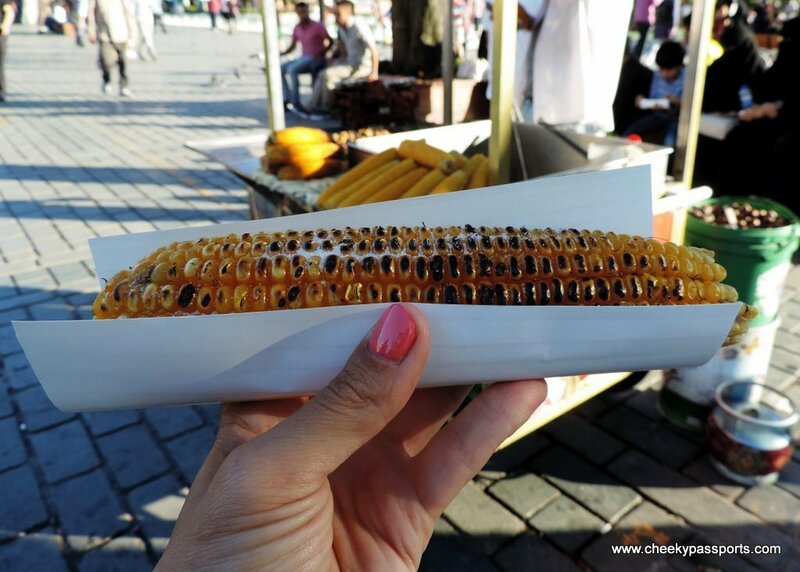 Grilled corn on the cob can be bought for just 2 Turkish Lira (about €0.40) around the Hagia Sophia area, a large glass of fresh orange juice costs 5 Turkish Lira whilst a bottle of water costs 1 Turkish Lira (about €0.20). Cat-lovers will be delighted with the huge number feline species roaming about Istanbul’s streets! Related: Read more about our food related blogs from around the world! The Basilica Cistern, one of Istanbul’s many cisterns was definitely the highlight of our layover in Istanbul. Recently featured in Dan Brown’s “Inferno” and previously used as a water reservoir, the eerily-lit underground chamber is held up by 336 marble columns with elevated walkways around them. Do not miss the two large medusa heads which have been placed at one end of the cistern and notice the several large fish which can be seen swimming around the dark, shallow waters. 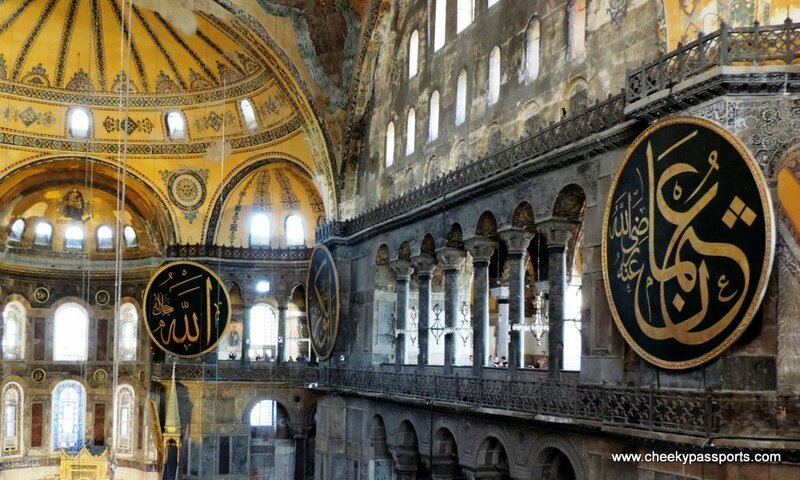 A must see during your layover in Istanbul! 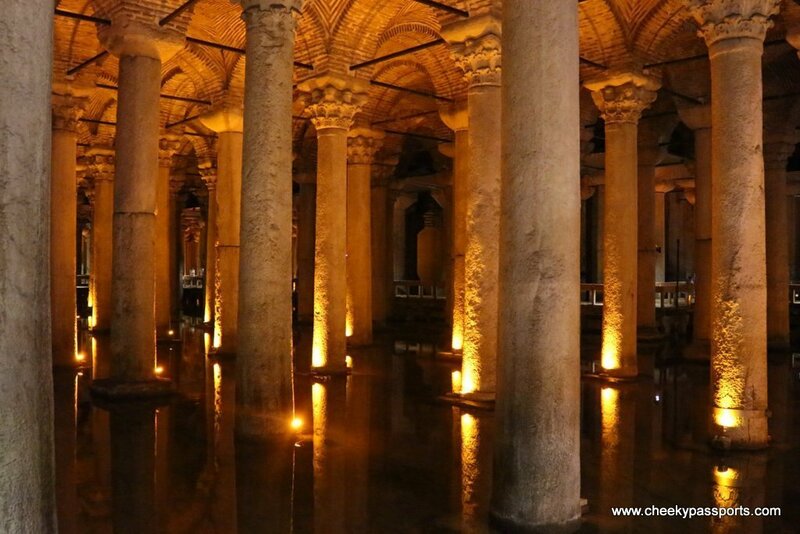 The cool passages of the cistern provide some sweet relief from Istanbul’s intense heat, so consider going underground for while! Entrance fee is 20 Turkish Lira (about €3.50) . Use of tripods for photography is not allowed. Unless you can smuggle in a GorillaPod, try steadying your hands by supporting your arms on the railings for a better picture! 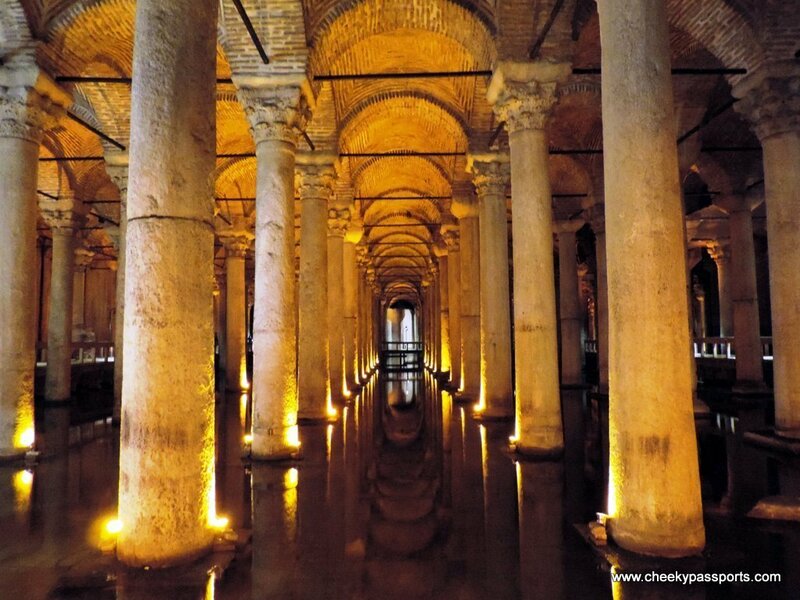 If you only have time to visit one sight during your layover in Istanbul, we highly recommend the Basilica Cistern. 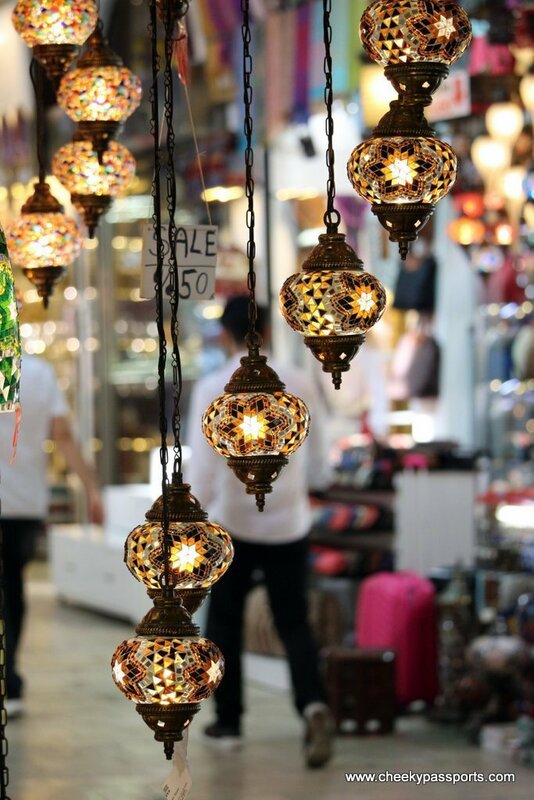 One of the largest covered markets in the world, Istanbul’s Grand bazaar is a huge labyrinth of little shops selling everything from Turkish lamps and ceramics to gold and spices. 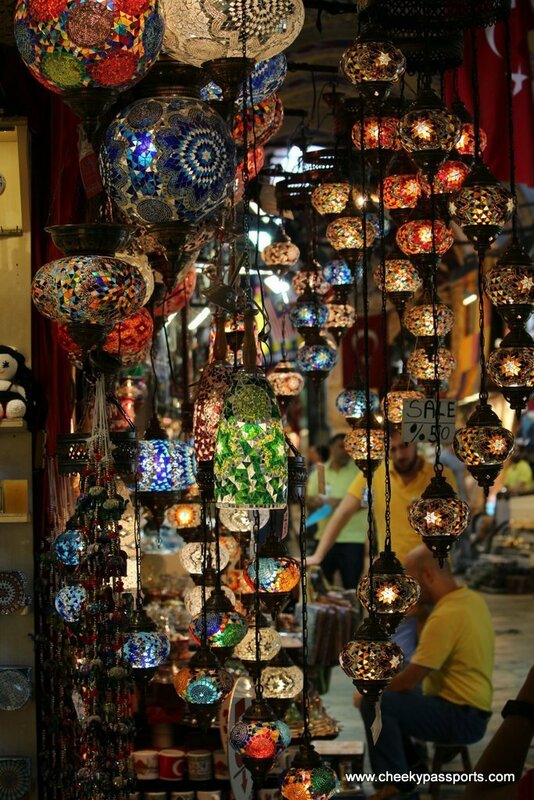 If you would like to take home some souvenirs, this is the most convenient place to do your shopping – be sure to haggle though since most of the prices have been hiked up! Even if you do not wish to buy anything, walking around the market whilst taking in the aromas of various spices and fresh caj is in itself an enjoyable experience. Shop owners were not as aggressive or annoying as we expected (given our experiences in other bazaars in Morocco and Egypt) and we felt very relaxed walking around the market. Haggle until you bring the price down to one you are comfortable with – do not feel pressured into buying something you feel is too expensive. It is ok to walk away; you will very likely be called back to purchase the item at your preferred price. Most vendors will be happy to arrange shipping by courier straight to your destination of choice, including bulky items such as carpets! I hate being stuck in the airport for layovers, or delays. I love these suggestions to get out of the airport and see the city! I would include the Blue Mosque and as many of these as I could fit into that layover. We’re glad you found them useful. We hate being stuck at the airport too and try to go out whenever possible! We did too even if we weren’t there for long, we hope to stay longer next time! You are so brave. I always hesitate to get out during an airport layover. Always worried I own’t make it back in time. That is something we really look into! You really need to check that you leave enough time to get back to the airport, otherwise it might not be worth moving at all! Really useful post – thanks. Istanbul Ataturk is often my layover between the UK and Kenya. Turkish Airlines offer a series of free city tours if your layover happens to coincide with one of the start times. Mine never quite has so maybe next time I’ll pluck up the courage to venture out alone and sample some of the city’s sights. It’s the transport times that scare me! I’m terrified of missing my connection by misjudging it! We’re so glad that you found it useful. Indeed missing a connection would be pretty annoying, and Istanbul traffic is awful so be sure that to factor that in! Ahh Turkey! I can’t wait to visit you!! I know there are often layovers in Istanbul – would you recommend extending your stay by a day or two? Yes totally! There’s so much to see and do. We had no time extend our stay on this particular trip but we definitely need to spend a few days in Istanbul at some point during our travels. This was incredibly helpful and inspiring!! The Grand Bazaar looks absolutely incredible. I love visiting the markets in every city i visit! I might just have to add Istanbul to my “travel to” list for 2017! Ohhh I loooove Istanbul! It’s one of my favourite European cities and your pictures and tips made me want to go right back! I had no idea how large Istanbul is until I visited back in 2014 – 14 million people!! Much bigger than Sydney here in Australia! I didn’t see the Cistern when I was there, so maybe something to add to the list for next time! Thanks, will bookmark this post! We would go to Istanbul any time, there’s so much to see! We totally recommend the Cistern, its quite quirky! I only had an 8 hour layover in Istanbul so I wasn’t able to really get out (it was meant to be a 3 hour layover originally) but I want to go eventually. How did you find the political state while you were there considering the coup? Hi Alexis, the city was pretty much business as usual. We did need to get our bags checked at the entrance to the main tourist attractions, but it was very smooth. All Pictures are all very pretty. I loved Istanbul a lot especially the food! Have a lovely weekend!